The Federal Government provides employees with ten paid holidays each year. Private sector employers may provide these holidays off with pay, holidays off without pay, or holiday pay for working on a holiday, but they are not necessarily required to offer any of these options. It depends on the employer's company policy regarding holidays. Washington's Birthday is designated as such, even though the holiday is commonly known as Presidents Day. *November 11, 2018 (the legal public holiday for Veterans Day) falls on a Sunday. For most federal employees, the holiday is observed on Monday, November 12. Federal law establishes these public holidays for Federal employees. When a holiday falls on a weekend, the holiday usually is observed on Monday (if the holiday falls on Sunday) or Friday (if the holiday falls on Saturday). Private companies are not required to close for holidays, or to pay overtime or holiday pay to their employees for working on a holiday. Even if they do close, they are not legally required to compensate workers with paid time off. However, companies may have policies that provide for holiday pay or paid time off. In a 2014 survey, the Society for Human Resources Management (SHRM) ascertained that, of those companies that anticipated offering paid holidays in 2015, the majority intended to observe seven specific federal holidays: New Year’s Day (95%), Memorial Day (94%), the day before Independence Day (60%), Independence Day (76%), Labor Day (95%), Thanksgiving (97%), and Christmas (97%). 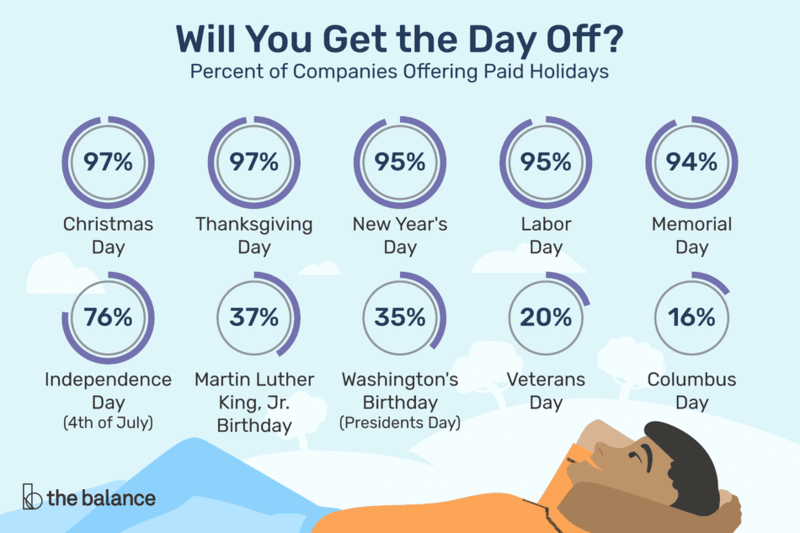 A smaller percentage of businesses also planned to offer paid time off for Martin Luther King Jr.’s birthday (37%), Presidents Day (35%), Columbus Day (16%), and Veterans Day (20%). How Will You Know What Holidays You're Entitled To? If the company doesn't explain their holiday policy during an interview, it is important to ask when you get a job offer. Become familiar with the company's policy on holidays so you know your holiday benefits before you accept the job and sign the employment contract, rather than after the fact. You don't want to be surprised when a holiday rolls around and you're asked to work. The 2017 Paid Leave in the Workplace survey from the International Foundation of Employee Benefits reports that some employers provide additional holiday days off including Christmas Eve (45%) and New Year’s Eve (23%). Thirteen percent of employers surveyed close their offices and provided a week of paid holiday leave between Christmas and New Year’s. 48 percent of employers offered a floating holiday day to employees, typically one or two days a year. Sometimes your work status determines whether you will be eligible for paid holidays by a private company. Full-time workers and / or workers with seniority are more likely to be allowed paid holidays than part-time employees are. Levels of seniority may also determine how many paid holidays your employer is willing to give you each year. Check with the Human Resources department for a list of paid (or unpaid) holidays at your company. Ideally, these should be clearly explained in an official employee handbook. The reason that holiday pay and time off isn't mandated is because the 1938 Fair Labor Standards Act (FLSA) (also called the “Wage and Hour Bill”) does not require payment for time not worked, such as vacations or holidays. Holiday benefits are generally an arrangement between an employer and an employee, as part of company policy, or as a negotiated agreement between the company and the employee's representative, e.g., a union or other collective bargaining unit. Will You Be Asked to Work on a Holiday? Some workers are more likely than others to be asked to work on a federal holiday, including shift workers, emergency personnel, and those in the healthcare, retail, and service industries. Although there are no legally mandated holidays, paid or otherwise, for these and other non-federal workers, employees who have to work because their industry doesn't stop for holidays often have resources at their disposal. For instance, many hospitals have policies that require medical staff to work either Christmas or Thanksgiving, but not both. Furthermore, some organizations will offer holiday pay (time and a half, a bonus, or some other incentive/reward), even though they're not required to do so. Bottom line: to find out where you stand in terms of holidays, you'll need to talk to Human Resources or your manager. Don't be shy: it's perfectly reasonable to want to know when you'll be expected to be at work so that you can make your own plans or coverage requests. Related Articles: Do I Get Paid for Working on a Holiday?